"Fresh, colorful, and delicious! One of my Asian co-workers taught me how to make this easy culinary work of art. Dress with your choice of salad dressing. My friend likes roasted sesame dressing, which is very nice. It's available in Asian grocery stores." 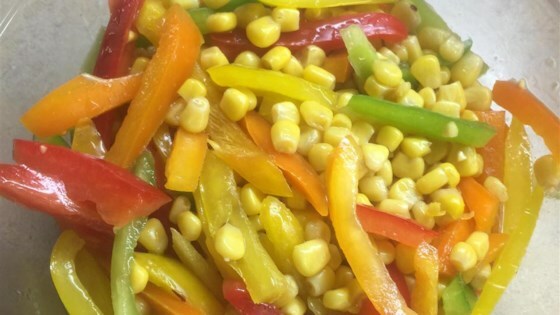 Toss corn with sliced green, red, yellow, and orange bell peppers in a large salad bowl until thoroughly combined. Pour sesame salad dressing over salad and toss again. Easy, grab ‘n’ go salad for lunch! I made this per recipe and it was great! I kicked it up a notch a second time with pomegranate seeds and bean sprouts.